I enjoy cooking, and have for many years. So why hadn't I ever tried making my own chicken stock before? I use it in so many recipes--from soup to casseroles--that I figured I should count it as a kitchen staple. So, I went to the grocery store, bought a whole chicken, and went to work! My stock-making process took me a few days since I cooked the chicken one day, actually made the stock the next day, and then skimmed the fat and put it in containers on the third day. I'm sure it could all be done in one day, but I just don't have enough time after work to get it all done at once. Please keep in mind that your stock will need to simmer for at least three hours, so make it when you will have the extra time. 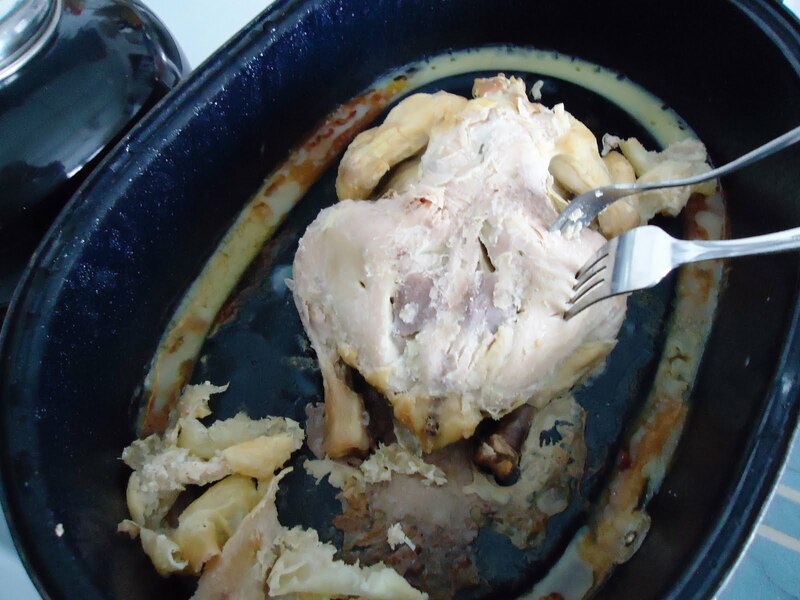 If you have access to the "creepy" parts of the chicken, make sure you use them. The neck, feet, heart, gizzard, and kidneys will add incredible flavor and thickness to your stock. 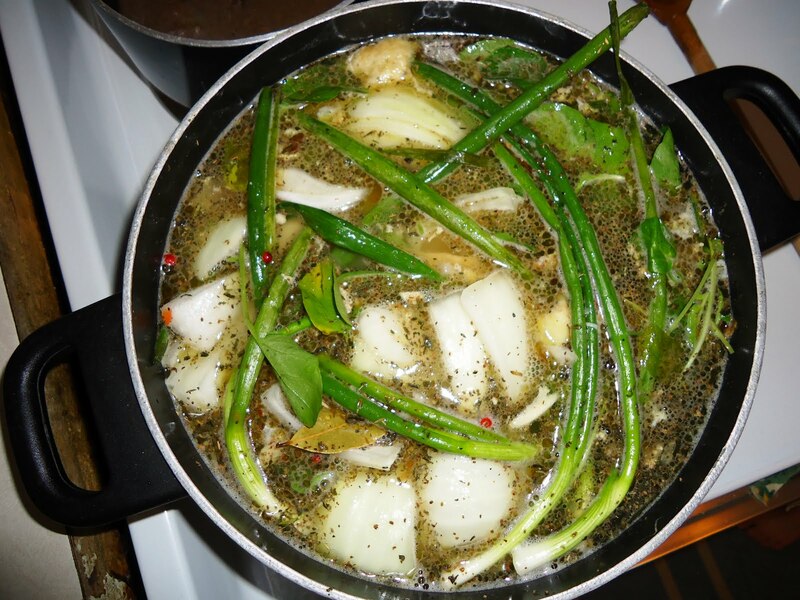 Save the liver for something else though, as it tends to add an unpleasant flavor to stock. When you are actually simmering your stock, you'll be using these extra parts, along with the bones and skin from the carcass. Adding a bit of vinegar to the stock helps to pull more flavor from the bones. As for the vegetables and herbs included, feel free to substitute, add, or change any of them. Use what you have on hand. Leftover veggies work great for making stock. 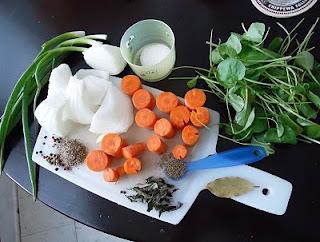 Most of these ingredients were used just because they were what I had on hand--some leftover watercress and green onions from another meal, celery seed because I didn't have any actual celery--so subsitutions can be made if necessary. 2. Rip that bird apart. Next, I took all of the meat off of the bones and put it in a storage container for another use (chicken dumpling soup to be exact). So, I was left with skin, bones, and cartilage for my stock, along with some creepier pieces--the heart, gizzard, feet, neck,etc... We raise our own meat birds, so it is easy enough for us to save these parts. They will give your stock amazing flavor. 3. Combine the chicken bones, skin, and parts in a large pot. Don't be scared, the feet will give your stock a richness like you've never experienced before. I turned my stove on medium-high heat and waited for the stock to come to a boil. This took a bit because my pot was really full. The next time I make stock, I will defintaley use a larger pot! Once the stock began to boil, I turned it down to low. At this point, if there is foam on the top, you should skim it off. I allowed the stock to simmer for 3 hours, stirring it occasionally. It smelled really yummy as it cooked, so don't make it if you're hungry. The stock cooked down some during the process, so my pot was not quite as full by the time the it was done. Now, you could cook it longer than 3 hours for a more concentrated stock, or even boil it down to make boullion cubes if you were so inclined. I chose not to this time, so I turned off the stove when 3 hours had passed. Once you have cooked the stock to your liking, you will need to strain out all the chicken parts and veggies. 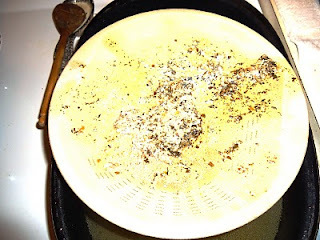 To do this, I put a colander into my roasting pan and poured the stock through it. This caught the big parts. The big parts I put in the compost pile (except for the bones). This gave me a clear, golden stock. 6. Cool it, skim it, and package it. I put my stock back out on the porch to cool over night. The next day, I brought it back in to skim the fat off the top. Since I had allowed it to cool, the fat had risen to the top and hardened. This made it very easy to remove. I saved that fat; I thought maybe I could use it in a gravy to add some flavor. Once the fat was off, the stock was put into containers and stored. I used plastic containers, into which I poured 2 cups stock each. I ended up with around 10 cups of stock total. The containers were labeled, dated, and then stored in the freezer. I hear they will keep for several months in the freezer, and I can burn through 10 cups of stock in no time. I have taken to making my stock in a crock pot now. I still roast my chicken ahead of time and pull the meat off the bones, but I then combine all the ingredients in a crock pot and set it on low. I have let it go for as little as 10 hours, or as long as a couple days. I have also started pressure canning my stock to save freezer space. I can in pint and half pint jars, which usually work out well for the amounts called for in most recipes.